Friday 17th March @ Howler in Brunswick. Tickets $15 Pre-Order, $20 on the door (subject to availability). Doors: 7.30pm, Show: 8.30pm, After Party in the main bar till 1.30am. ** NB This issue of BINADW contains the imagery and voices of those who identify broadly across the gender continuum, including but not limited to as genderqueer, cis & trans. 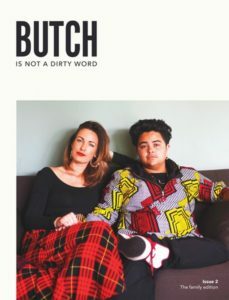 Butch is Not a Dirty Word is a publication celebrating butch identity and culture. Thematically, our second issue focuses on butches and their families. In similar fashion to the first, the publication contains a series of essays and photographs exploring this gender experience. Family is all too often the initial site of rejected masculinity for young butches, because of society’s prejudice, it often takes families quite some time to come around. This takes us back to the mission of BUTCH IS NOT A DIRTY WORD, and its very title. For many queer masculine identifying folk, their first experiences of having their butchness not only accepted, but celebrated, comes from their community of chosen family and close friends. Within the pages of this issue, we aim to portrait butch people more authentically than the archetype allows, existing happily and experiencing genuine and loving connections with those around them. Photographed: Tandiwe Aebi-Moyo & Nic Aebi-Moyo, Kat Williams & Elliot Oakes, Monica Martinez & Sophie Warren, Kirsty Webeck & Luke Eade, Katie Dutton & Family, Tuna Poanessa, Summer Russel & Lauren McCartney, Sarah Waxman, Candy Royalle, Michelle Ring & Laur McConnel, Lexi & Angela Buckfield, Hannah Christensen & Helen Tuto, Ro Allen & Family, Jax Jacki Brown & Anne Standen, Mill O’Sull & Rachel Zbukvic, Nneka Onuorah, Mojo JuJu & Miss FrankieV, Manumalo & Elizabeth.